MONEY BACK GUARANTEE: Simply return any unused product for full refund, credit, or exchange. Your choice. In Person — Place your order with our salesperson in your area. Phone — Use our toll free number to place your order. Call 1-800-531-9744 anytime, 24 hours a day, 7 days a week, for fast delivery via UPS. FAX — Fax us your order anytime, 24 hours a day, 903-641-0383 using the order form on this page. Contact Form — Fill out the contact form on the CONTACT US page. Use the Convenient Order Form Below. Feel free to make some extra copies for future use. 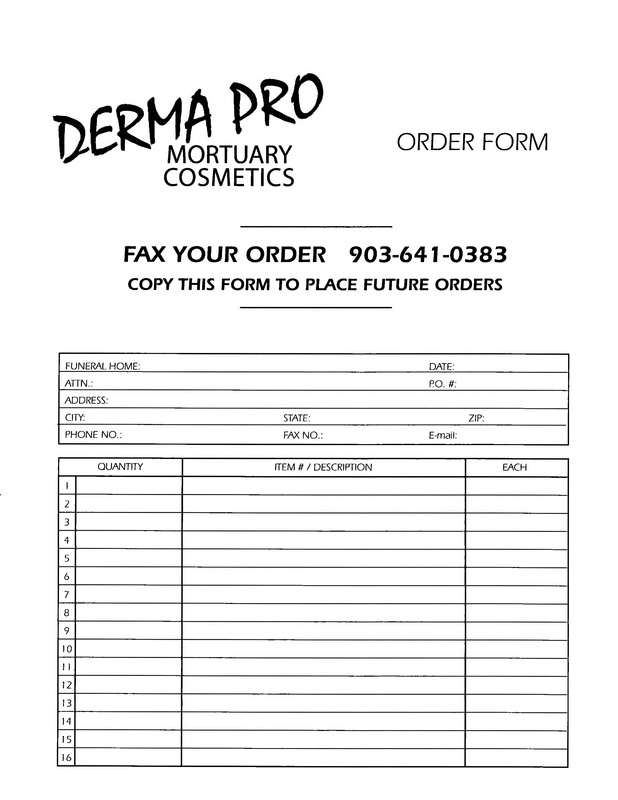 Print and use this convenient order form to Mail or Fax your order. Our quality products are designed for mortuary use only. A representative will contact you to complete your order. You may also print an order form and FAX or mail it to us.